When put on a 3-sided silver octaflexagon, all the rows, columns and major diagonals in the following magic square sum to 222, even after flexing. A flex mirrors each of the four smaller squares along its diagonal and rearranges them, so most magic squares wouldn't survive in this environment. To make a magic octaflexagon, click on the following image to get the full sized version. Print and cut out. After cutting it out, also cut along the two dashed lines. Pre-crease along all the gray lines. 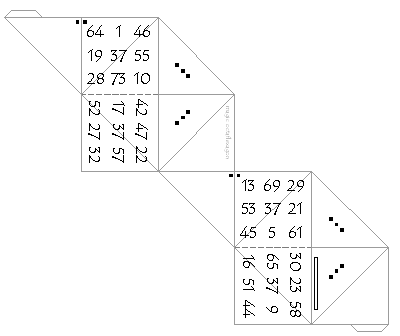 Find the two numbered squares connected by only a single edge and fold them backwards and paste in place. You should see two pairs of adjacent triangles with three squares on them. Fold these adjacent triangles face to face. 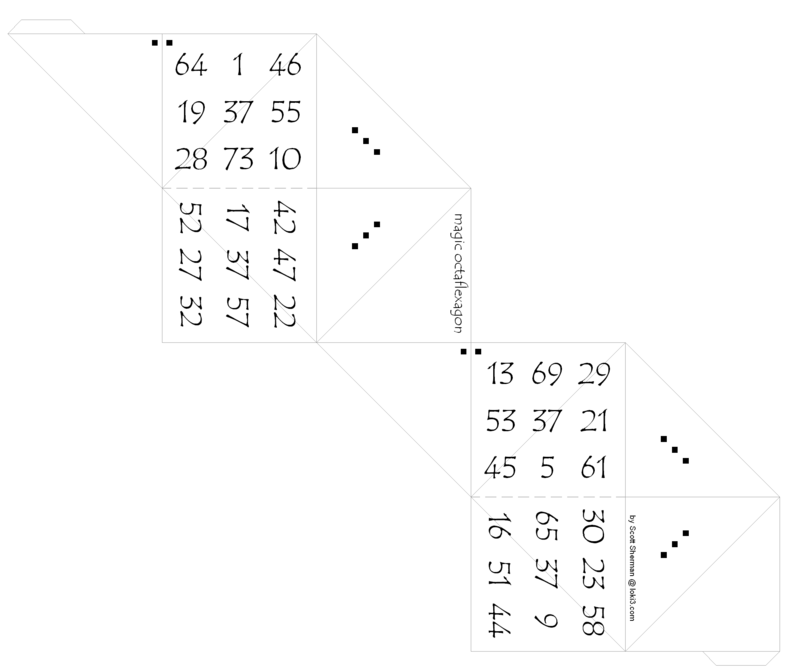 Fold the two pairs of adjacent triangles with a single square in the corner back to back. You should now have a large square, with all the numbers on one side. Tape the extra flaps down to finish the flexagon. To flex the flexagon and rearrange the numbers, start from the numbered side and perform a pinch flex, similar to what you can do on a hexaflexagon. Fold the four diagonals into valley folds and the four lines between the squares into mountain folds. Bring the four corners together in the back and open up the center. This rearranges the numbers, but all rows, columns and major diagonals still sum to 222.